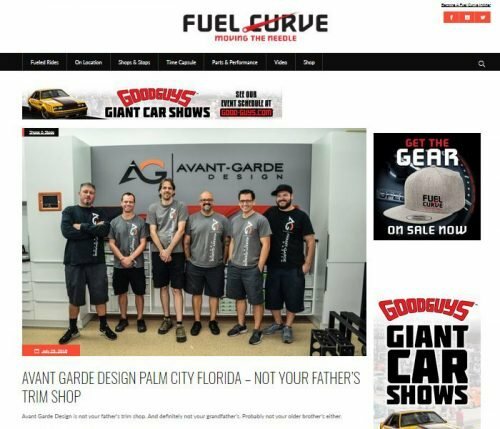 Recently, Avant-Garde Design was honored to have a wonderful write up on www.FuelCurve.com by Dave Doucette. If you are not familiar with Fuel Curve, it is a Good Guys publication. Dave did a fantastic job of defining what we do in words and pictures. Thank you Dave Doucette and Fuel Curve! “Avant Garde Design is not your father’s trim shop. And definitely not your grandfather’s. Probably not your older brother’s either. The Palm City, FL, based shop is just a few years old, but it’s already racking up major awards (not the kind that come with a lampshade-on-a-leg trophy) and redefining the art and science of crafting high-end custom interiors.